Social media skills are an important part of many jobs these days, and not just for marketing companies. Nearly every business uses social media in some ways, and the larger ones hire teams of people to work in this digital platform in one way or another. These jobs often require a bachelor’s degree and tend to be listed among marketing positions on job boards. They often pay well. According to CIO.com, 11 of the 20 most common social media jobs pay above the national average, with an average salary of $43,400. 1. Blogger/Content Specialist/Copywriter — Bloggers and copywriters are responsible for creating, editing, and posting content that matches a brand and uses keywords to help drive traffic to that company’s website or social media profiles. Bloggers are sometimes self-employed, but more companies are hiring these content creators to monitor and produce content full-time. 2. 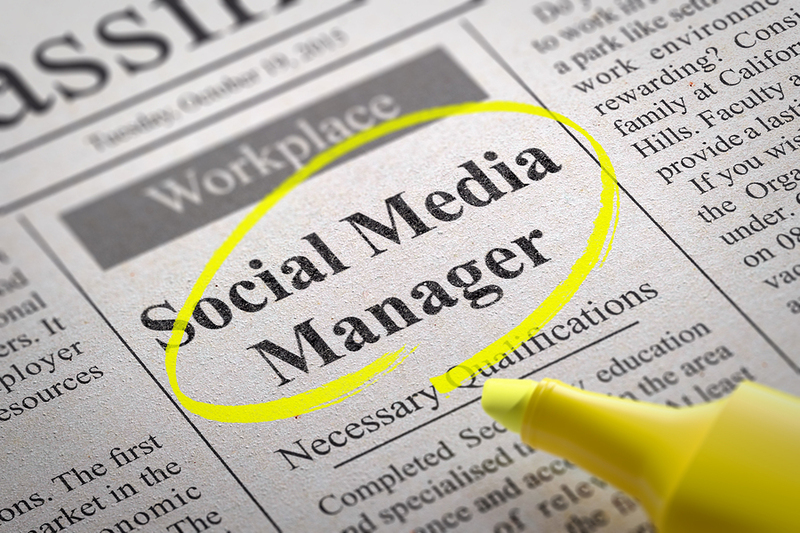 Social Media Manager — This entry-level gig is one of the most common social media. This position is exactly what it sounds like: managing a company’s profiles on Facebook, Twitter, Instagram, Pinterest, Google+, LinkedIn and more. While it sounds like a dream to some, managing social media accounts means keeping an eye on things 24/7. Plus, managers need to be good gatekeepers, monitoring content for negative or sensitive posts and watching trends. ● Average annual salary: $45,717. 3. SEO Specialist — A Search Engine Optimization expert works to boost a company’s website rankings. In other words, they make sure a company can be found by those searching online. SEO specialists analyze websites and search terms to help create relevant content, organize a company’s online listings, and make sure the website is set up properly for the ideal search results. ● Average annual salary: $46,371. 4. Online Community Manager — While social media managers post to and manage a company’s accounts, an online community manager focuses on clients and customers. They may use social media to interact with clients, answering questions or handling problems. They may also rely on online comments, message boards, and email groups. Many online community managers monitor the social media platforms to make sure the company brand is properly represented. ● Average annual salary: $47,796. 5. Public Relations Manager/Communications Specialist — The PR and communications person handles the company’s press releases and marketing events, holding press conferences, answering questions from journalists and sometimes managing online content in addition to internal newsletters. Those in this job might be on call 24/7 to handle negative publicity if it arises. ● Average annual salary: $47,077 for communications specialist and $61,100 for PR manager. 6. Content Marketing Manager — The use of social media is part of an overall marketing tactic known as content marketing. At some companies, Content Marketing Managers might handle the responsibilities of a social media manager, but may also oversee other areas of content marketing, such as creating and managing email marketing campaigns and other forms of content such as podcasts or webinars. 7. Digital Strategist — This job requires the critical thinking necessary to analyze data, understand the competition and the market, and produce marketing ideas for your company’s services or products. Digital strategists also help create and edit content and manage company websites or other digital programs. They provide counsel, identify future trends and company initiatives, and track the company’s digital marketing efforts. ● Average annual salary: $63,800. 8. Digital Marketing Manager — In some companies, this job is the same as a digital marketing strategist. In others, the manager oversees a team of strategists. In that case, the digital marketing manager creates and executes marketing plans to increase revenue, using data and analysis to develop campaigns and gauge results. Depending on the company, this person might also study ways to improve a customer’s user experience based on technology. 9. Internet/Online Marketing Director — This person defines the overall online marketing strategy, sets targets for a company’s marketing campaigns, conducts market research, analyzes data to review the performance of campaigns and decide next steps. The Internet Marketing Director works with other teams in the company to align goals and strategies, especially the sales team. He or she may manage a department budget. This person advises on marketing automation, lead generation, and ways to improve a company’s processes. ● Average annual salary: $97,400. *All pay information according to PayScale.com.